This article is a review of YOJIMBO. Imitation is the sincerest form of flattery, and legendary Japanese director Akira Kurosawa should be flattered. His masterpiece SEVEN SAMURAI was reimagined as THE MAGNIFICENT SEVEN, film and TV series, and animation maestro Pixar’s A BUG’S LIFE. YOJIMBO, released in 1961, was the muse for the Spaghetti Western and remade as Clint Eastwood star-making vehicle A FISTFUL OF DOLLARS, and Bruce Willis Depression-era gangster flick LAST MAN STANDING. It is understandable as the story is so simplistically brilliant. 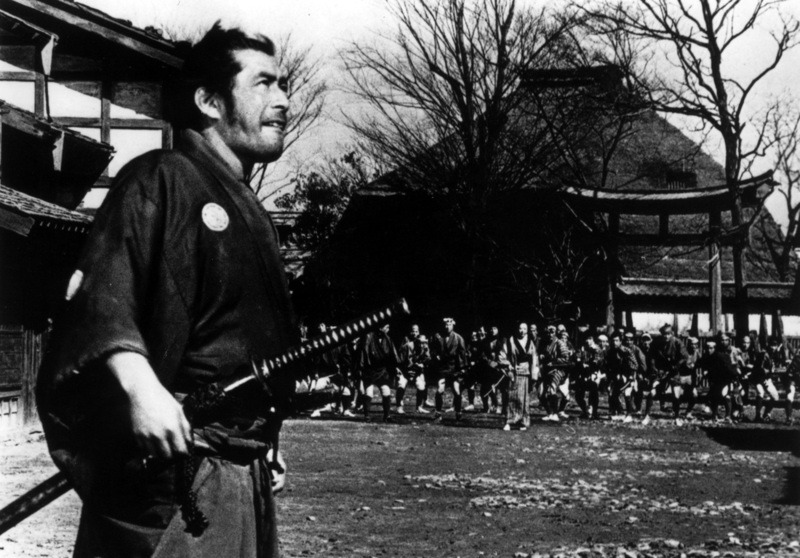 A wandering ronin (masterless samurai) played by Toshiro Mifune comes across a beleaguered nineteenth century Japanese town; beleaguered by two warring gangs fighting for its control. 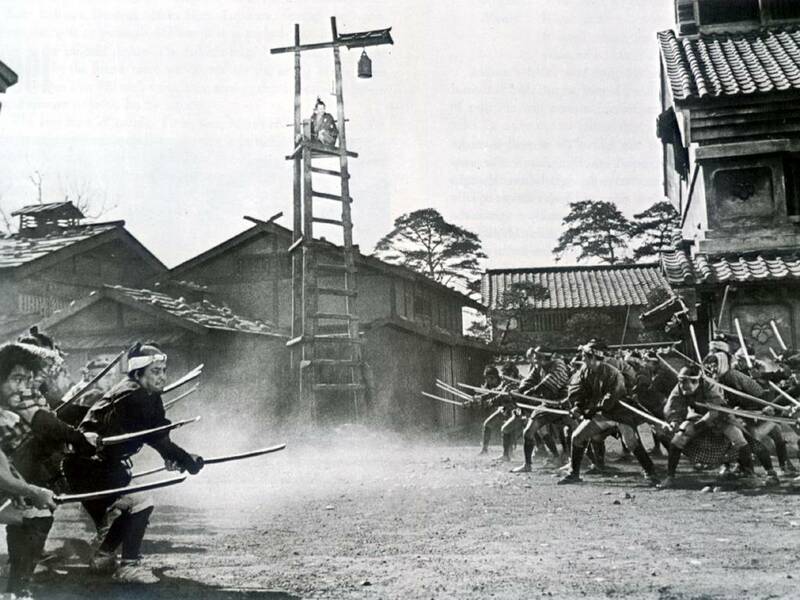 A Lone Ranger-style character, this heroic ronin decides to get the gangs to wipe each other out and return the people to peace by pretending to be a bodyguard (yojimbo). These gangs are greedy, unmerciful and immoral, hiring fighters to swell their numbers. The townsfolk are brutalised, caught in the cross-fire, physically as well as economically. They are commodities that are used by the gangs and the town’s resources are drained by the conflict. The town in the middle of the Japanese countryside is the Wild West (or should I say Wild East!) without laws or justice. The guard (effectively the sheriff) is useless and corrupt and will not arrest the criminals. It is left to the ronin to put things right. 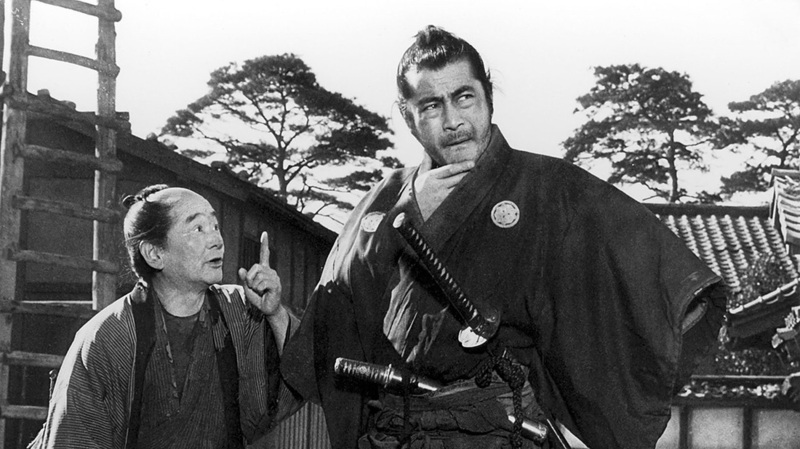 The samurai films of Kurosawa were influenced by the Hollywood Westerns, such as those made by director John Ford, and in turn he influenced the genre that had inspired him. No date is given for the setting of the film but it appears to be the eighteen-hundreds as, although most fight with swords, one carries a revolver. “The young ones have gone mad.” Yojimbo could be a nod towards a post-Second World War loosening of family and societal deference by the new youth. In the movie they are no longer keen to work on a farm and eat “mush”. The wide world outside the home is shown to be both thrilling and extremely dangerous. The theme of teenage waywardness in Japan is explored further in the futuristic BATTLE ROYALE. On the other hand the film may in addition dispel myths and debunk nostalgia, about times past when the world was not upside down after a cataclysmic war. This look at Japan shows the formality and respect that have existed since the introduction of the Shogunate has not always manifested itself successfully. In the black and white cinematography we see a sad but exciting look at immorality unchecked. And the film is so gripping. As with the sequel, Sanjuro, Kurosawa’s composition is beautiful, with the choreography of movement, fighting and repose artfully framed. There is a scene where the ronin seems to have his plan work like clockwork as the two gangs move across the main street ready for a full pitched battle that has tension and humour. The film may have a melancholy premise but is lightened by bursts of wit. Toshiro Mifune’s character is a precursor to Clint Eastwood’s ‘Man with No Name’. When the ronin is asked who he is, his response is enigmatic after looking out at the rural surroundings, ‘Sanjuro Kuwabataké’ (Thirsty Mulberry Field). He does not want anyone to identify him. 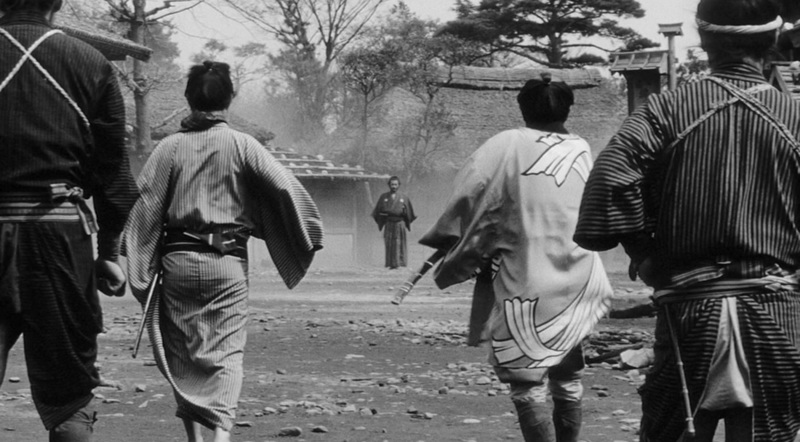 Sanjuro is a movie icon. 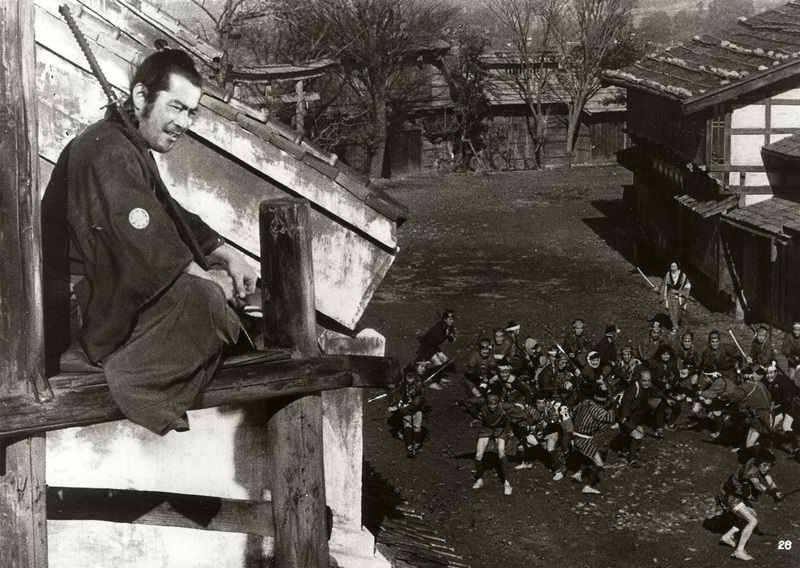 YOJIMBO shaped cinema in Japan and America. Pretty impressive.